Studies show that when a child is hospitalized, the love and support of a family is as powerful as the strongest medicine prescribed. Ronald McDonald House Charities of Alabama is able to help provide that love and support by keeping families close to each other while their sick or injured child receives the care they need at a local medical facility. Our House of 41 rooms has been undergoing a renovation for the past couple of years. Each room needed a lot of love, but due to our high occupancy rate, the rooms were renovated a few at a time. 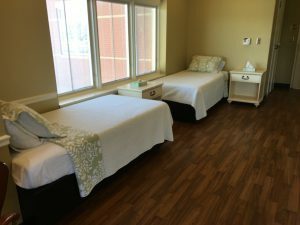 Thanks to the Robert Meyer Foundation, two of our rooms were able to get just the love they needed. RMHCA provides a place of comfort so when those families come back from the hospital, they have a place to relax. The renovations were needed to ensure we are truly providing that comfort for each guest family — new, bright quilts and pillow shams were added to each room, local artwork hung, lamps were placed next to the bedsides, and so much more. The Robert Meyer Foundation is focused on health and welfare organizations locally and we are so thankful for their support of Ronald McDonald House Charities of Alabama. During our Adopt-a-Room Donor appreciation event, they enjoyed an afternoon touring the House and taking pictures with our signature red noses. This picture (below) will be framed and hung in each of the two rooms sponsored by the Robert Meyer Foundation so that each guest in that room can see who helped make our House a home!